It’s best to let a mosquito bite heal naturally. So, you have a really annoying and itchy mosquito bite. It’s tempting to just burst it open and squeeze, right? Wouldn’t that help get the toxins out and get your sanity back quicker? The answer is no. You shouldn’t pop a mosquito bite because it can cause many complications, described below. And it makes it take longer for the mosquito bite to go away, too. Let’s take a look a the top 5 reasons popping a mosquito bite isn’t a good idea. How long does it take for a mosquito bite to go away naturally? It depends on the type of mosquito and your specific allergic reaction to its injections. In other words, it varies. Generally speaking though, a mosquito bite can take up to 24 hours to go away on its own. But 30 minutes to a few hours is more typical. If you pop the bite open, it will take days more for the broken skin to heal. Now, it is true that popping a mosquito bite can lessen the immediate itching. This phenomenon occurs because the itching is replaced by the pain of an open wound. Both sensations of pain and itchiness transmit to the brain via the same nerve endings. But, pain is dominant over itching because it is more important for survival, so that is what we feel. Another, better idea is to make an X on the mosquito bite with the fingernail of your thumb or index finger. (Detailed instructions via the link). Don’t press hard enough to break the skin, though. This trick reduces the itching temporarily, without any of the dangers caused by actually popping it open. 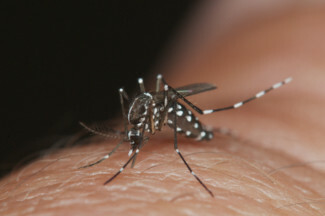 When the skin over a mosquito bite is cracked open, it is ripe for infection. An infection can be quite painful, and adds days to the length of healing time. A skin infection can be dangerous, too, if left untreated. Severe infections can potentially enter the bloodstream and travel to other parts of the body. If you do pop a bite, keep it clean with disinfectant wash. Do cover it with sterile gauze to protect it until the top layer of skin is fully healed. Now, it probably won’t be a big scar. But, there will likely be a small pockmark left over when the bruise heals. Scarring is a potential risk any time a wound scabs over. You may not care about it if the bite is in an inconspicuous place. But be extra gentle with a bite on your face, lest it leave a permanent mini-crater as a momento. Cutting open a bite will cause bleeding and leaking of fluids such as blood plasma. This is not only dangerous and unsanitary, it’s messy, too. You will have to constantly dab the bite with tissue paper to keep the blood at bay. Fresh blood can stain clothes, furniture, and bed sheets. Best to just leave that mosquito bite be. Popping the bite may reduce itching in the short term. But, a mosquito bite completely heals within a day, at most, if you don’t touch it. The pain and irritation will continue for days longer if you squeeze it open. Popping a mosquito bite can be tempting. But, for all the reasons mentioned, it’s best to resist the urge. Consider the long-term consequences before acting hastily. It’s better to bite the bullet. Endure that initial agony of a mosquito bite with bravery and without breaking it open. Later, you will be thankful you did.